Representatives of Realogics Sotheby’s International Realty (RSIR) and Tiger Oak Media, publisher of Seattle Magazine announced today a new real estate portal to host content in print and online with SeattleMag.com. The exclusive platform will distribute news media from The FutureCast Forum – a collaborative of third-party opinion leaders that explore current and projected market fundamentals influencing the Seattle/Bellevue metro area by 2020 and beyond. It’s founding members and guest columnists will provide timely insights on the state of the economy, commercial and residential development, evolving demographics, wealth management considerations, government policy, lifestyle trends and international influences that are shaping the regional landscape. RSIR will also feature relevant property listings on the new media channel. Beginning October 2017, Seattle Magazine will include a full-page feature provided by The FutureCast Forum as well as weekly posts on its popular website and social media channels. The media partnership will be celebrated during an evening reception on September 28th. Spear will moderate a BISNOW panel discussion with FutureCast Forum members for registered guests. 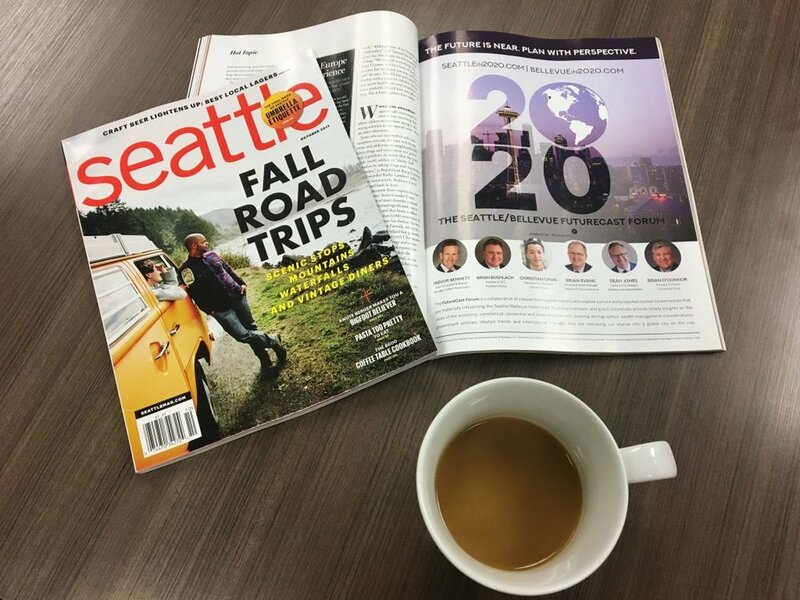 The October edition of Seattle Magazine showcases the first in a series of FutureCast Forum features. FutureCast Forum and BISNOW will be hosting a must-attend commercial real estate on September 26th to examine the engines driving the most energized city in the Pacific Rim. National legends will convene that morning to discuss Seattle’s meteoric rise to global city trough the lens of tech innovation, global business leadership, domestic and international investment. Through three uniquely high level discussions, the seminal forecast for Seattle’s development will be laid out for our audience. Guests are welcomed to register for more information at www.Seattlein2020.com. An initial web launch will take place September 26th, 2017.